At this year’s Annual General Meeting 24 representatives of all national associations involved in ECA met in Riccione – Italy where the European Cheerleading Championship 2012 will take place. 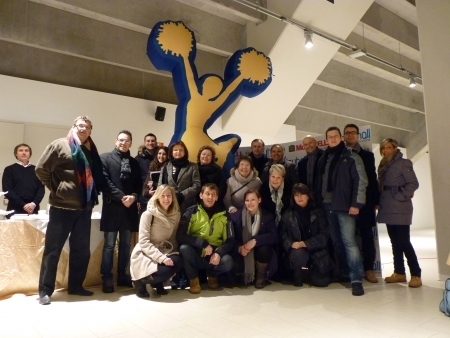 On Friday the Italian Cheerleading Federation presented the ECC 2012 venue to the representatives so they can pass the information to all the teams that will be qualified. They were all very pleasantly surprised by the new hall and its surroundings so we all expect a great ECC. The annual general meeting on Saturday was very successful as all the representatives agreed on the development guidelines of our Association. They all exchanged their experiences and good practices that they can use and try at home in their national federations and we are sure, you will be able to see some changes in the future. In addition they re-elected President Mr. Vojko Korošec and 3 new board members – Riccardo Cavalieri (ITA), Livia Stričak (CRO) and Martin R. Jackson (UK).